“Merely by describing yourself as black you have started on a road towards emancipation, you have committed yourself to fight against all forces that seek to use your blackness as a stamp that marks you out as a subservient being.” – Steve Bantu Biko, The Definition of Black Consciousness (1971). I was approached by trader on the street the other day. She wanted to sell me a miracle product that would change my life forever. The cream she had could lighten my skin in just 7–10 days. I was like, “I like my skin exactly as it is.” She looked at me like I had just told her I enjoyed going to work without my clothes on at times. Being the diligent saleswoman, she made all sorts of promises. Chinese skin, being one of them. In Zimbabwe, this has become a sought after commodity. I am not Chinese. I am a black woman. So what’s wrong with that?, I asked myself later. I was born with dark skin. Is that supposed to be a disease? Why do I need a miracle cure that will make me a yellow bone? The Yellow Bone syndrome has become a pandemic in Zimbabwe. It is fuelled by the notion that beauty is based on the lightness of one’s skin. Thus being a light skinned black woman has become a status symbol for most women, and having a light skinned lady on your arm is the dream of several men I’ve met. In local Zimbabwean pop music, a significant number of male musicians pay tribute to the “Yellow bone”. Business in skin cremes and soaps that can make this dream come true are flourishing despite the prevailing harsh economic conditions. The ironically named “Lunch Box” is one of the most popular cremes. It guarantees bleaching within 7 days. In addition to this, more invasive measures such as injections and pills exist on the market, at an exclusive fee. Image © Nan Tong Tianlan Cosmetics Co., Ltd.
Not many of my dark sisters can afford the skin lightening creams that have been approved by the medical authorities. As a solution, they visit the Robert Mugabe road to buy affordable yet harmful products. Walking down this road, you cannot miss the boxes of creams with ingredients lists that state various forms of mercury; Hg, mercuric iodide and hydroquinone. For as cheap as a dollar one can get a pot of cream. Despite the ban on placed on these creams by government and the warnings in the media, women are still compelled to slip into an alley to complete a transaction. They risk side effects such as liver and kidney damage, permanent pigmentation loss and skin cancer. It has been properly instilled in them, that black skin can never be beautiful. Popular culture presents the perfect black women as one with light skin and long flowing hair. This speech was relatable to considering how a lot of dark–skinned young women feel. As far as I am aware, black women begin to struggle with their skin tone from when they are small children. If they are lucky, they’ll become wise enough to understand and critique the culture around them. If not, they’ll succumb to the pressure to attain light skin. In film maker Ng’endo Mukii’s Yellow Fever, she talks to her nine year old niece in a beauty salon. The little girl relates to her how much she hates being born with dark skin. When young girls go through childhood despising their own beauty and desiring lighter skin, they grow up and muster the courage to go out and change it it. Many will do anything to get fair skin even if it eventually kills them. It is heartbreaking. My mother always called me a black beauty. And I grew up proud in that knowledge. Nevertheless so many times I have heard women use their daughters dark skin to insult them. “Get away. That’s why you are so dark,” you hear daughters chastised now and then. Now if a child is shocked into believing that darkness is her handicap, she will grow up believing that she is not beautiful. Believe me, her damaged self esteem will lead her to risk everything, including all forms of ill health and skin cancer in order to treat that perceived handicap. Rico with hydroquinone. Online advert contradicts that. © Nan Tong Tianlan Cosmetics Co., Ltd.
To me this is not only a health issue, it is very political. I’ve always wondered why our women reject the skin colour they have been blessed with? Rejecting your skin colour is just as good as rejecting the person that you are. Where does one get the courage to take a drop of cream labeled “White Girl”, to rub on their skin? You will never be a white girl, or in my case a Chinese girl. No matter how much pigmentation you lose, you’ll simply become a lighter version of yourself. Those who profit from selling skin lightening creams understand this self hatred perfectly well. It brings in money. Perhaps this is why my Nigerian trader promised me Chinese skin. Why is it so hard for us to get on with the business of loving being black? We may start with an appreciation of the fact that black women come in different shapes, sizes and different skin tones. Our beauty should never be based on the tone of our skin. Black people on and off the African continent have had complex struggles and triumphs over the powers that have tried to suppress our understanding of what it means to be beautiful. It would just be good to celebrate our diversity and to find pride in our heritage, which is never allow colourism define our standards. It’s already challenging enough, that as women, most of us tend to occupy second class citizen status in our various communities. But do we really have to feel inferior because of our pigmentation as well? As Mr Biko said, if you are not proud of your blackness it will be used to oppress you. Rather embrace it and revel in it. 1. Essence Magazine. Black Girl Magic Flashback; Watch the Lupita Nyong’o Speech Heard Around the World. 2. Brighton Chireka. 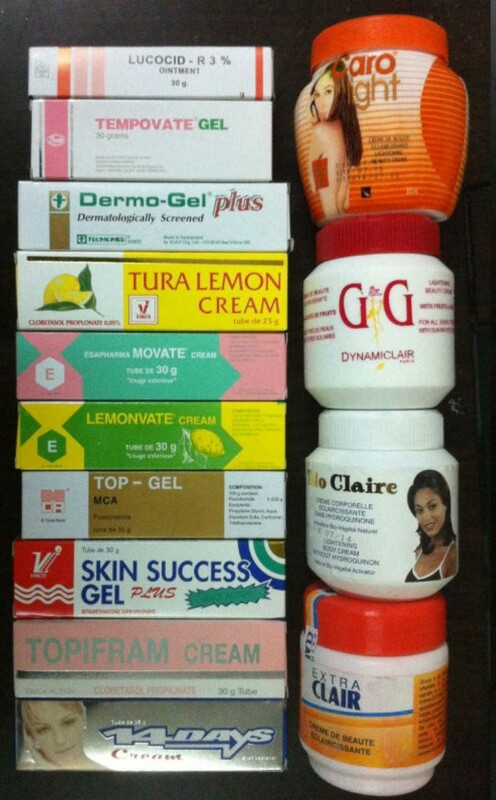 Let’s talk about skin-lightening creams. 3. Nantong Tianlan Cosmetics Company Ltd. List of products on alibaba. 4. Ng’endo Mukii’s short film can be viewed here.